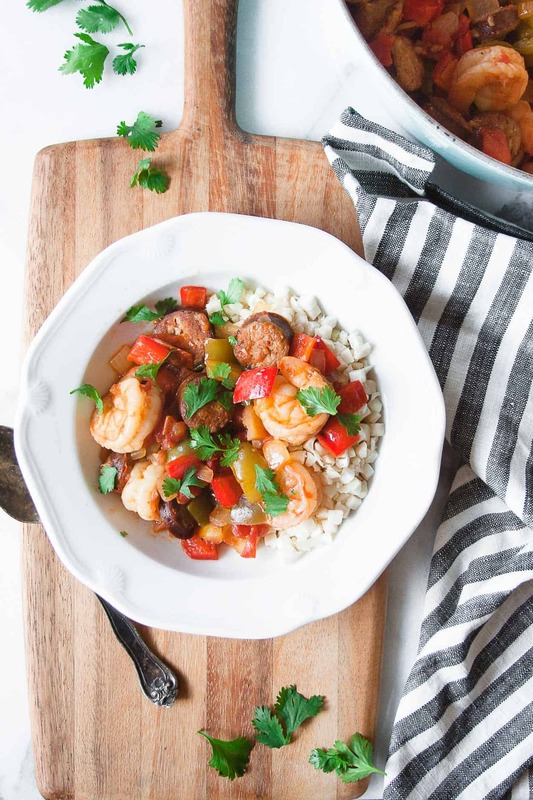 Spicy Whole30 gumbo is the perfect one pot meal for dinner tonight! 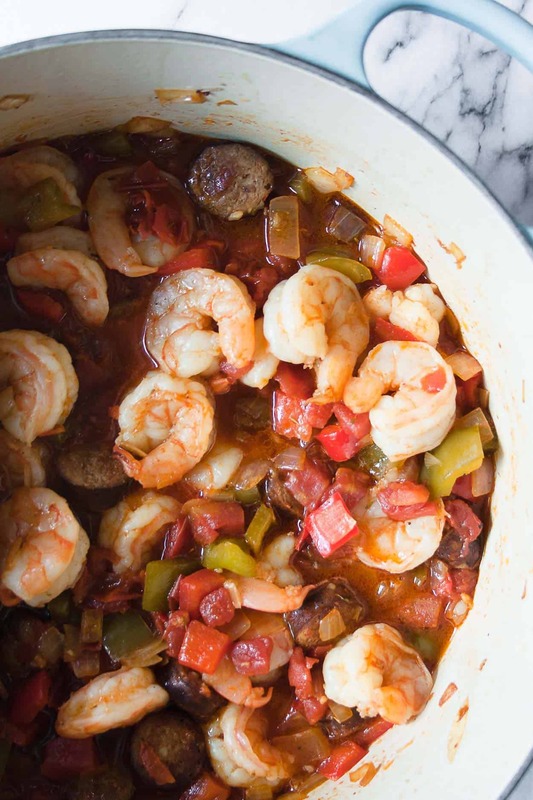 Made on the stovetop or the slow cooker, this classic dish is loaded with shrimp, andouille sausage, lots of vegetables and is sure to please the whole family. This gumbo has been giving me life. It sounds dramatic, and maybe it is, but it’s the truth. This entire year, life has been crazy. You know why. And I’m so incredibly happy and blessed that it’s been crazy. But as my plate has become more and more full, something had to give. And unfortunately, cooking and meal prep has fallen to the side. I’ve gotten in the habit of grabbing food or ordering in too often. It’s easy and convenient but not super healthy. I’ve noticed that I have been craving sugar a lot more – which is of course because I have been consuming a lot more sugar. I haven’t been as strict about diary and grains and can tell a difference. So I decided to do a little Whole30 reset! I started the reset on Monday and plan on doing it for a week or two, or maybe more depending on how it goes. 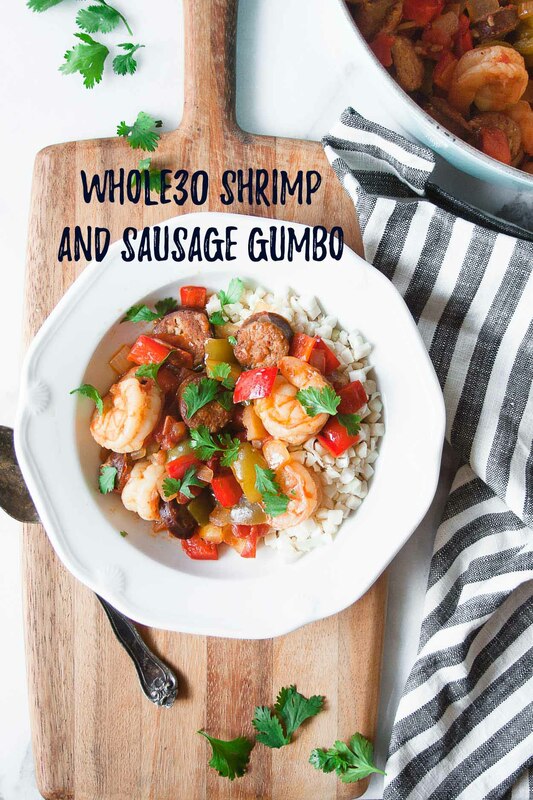 But let’s get to this recipe>> WHOLE30 GUMBO WITH SHRIMP AND SAUSAGE! I made this recipe multiple times this month, testing it to make sure it was just right, and then again last Sunday so that I could take photos. And it’s totally been saving me! There is something magical about cooking onions and garlic in a little olive oil – the smell is heavenly! 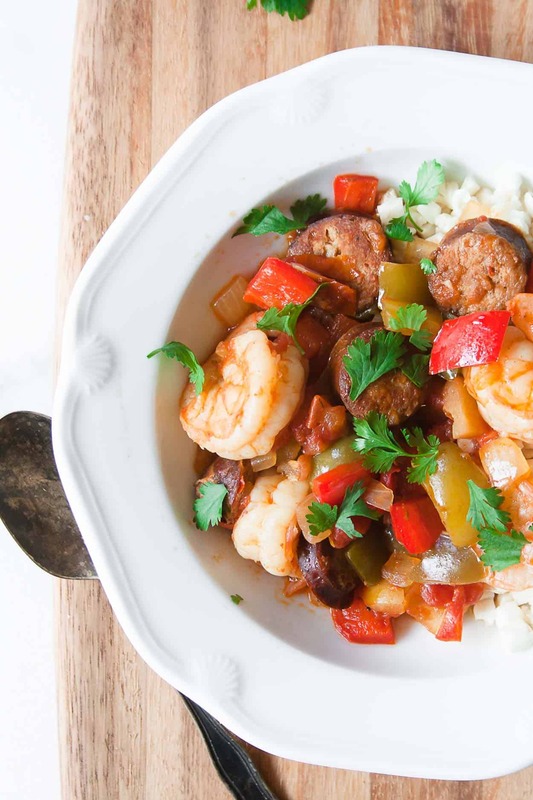 And then the peppers and tomatoes and andouille and shrimp! This is such a simple and flavorful dish. I cannot wait for you to make it! Make this Whole30 Gumbo and post a picture on social media and use the hashtag #imhungrybynature for a chance to be featured! Heat 1/4 cup oil over medium-high heat in a dutch oven or large pot. Add sausage and cook until brown. Remove from pot and set aside. Add in the diced onion and bell pepper. Season with salt and pepper and saute until nice and tender, about 6 minutes. Reduce heat to medium, add in the garlic, cayenne, and thyme and saute for another 2 minutes. Pour diced tomatoes and chicken stock into the pot, stir to combine. Add in the andouille sausage and bay leaves and bring to a simmer. About 5 minutes before serving, add in the shrimp and cook until opaque. This recipe can also be made in the slow cooker! 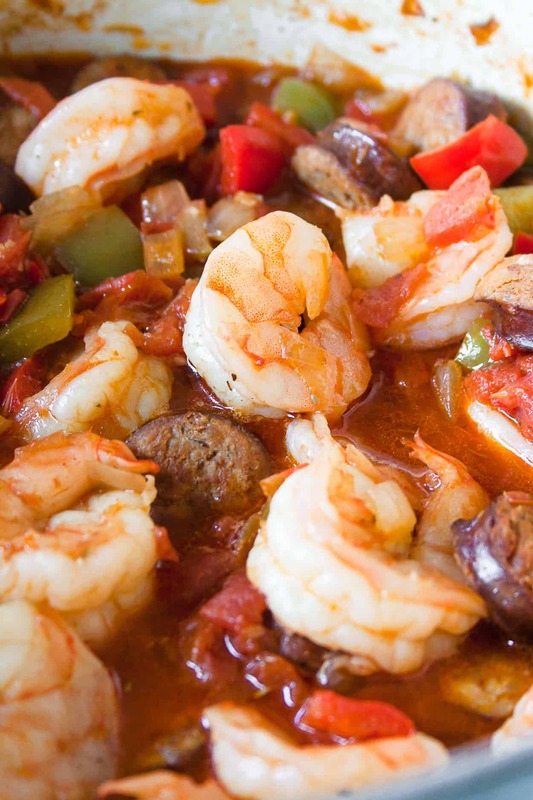 Add all the gumbo ingredients EXCEPT the shrimp to the slow cooker. Stir to mix well. Cook HIGH 3-4 or LOW 6–7. In the last 15-20 minutes of minutes cook time, add gently stir in the shrimp. Keep warm until ready to serve. Remove bay leave prior to serving. 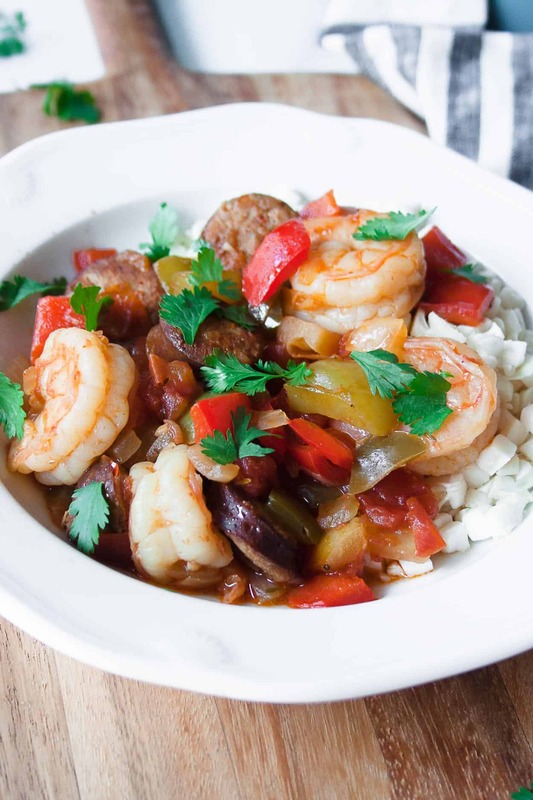 Pin this Whole30 Gumbo for your next round! How would I use frozen shrimp? I would thaw your shrimp while the rest of the dish is cooking. Just place them in a colander and run them under cold water! You could also try adding the shrimp in frozen, but I have not tested that method.